Private Down Under is the seventh installment in the series of novels following the escapades of the “Private” group, an elite private investigation firm with branches around the globe. This book, as the title suggests, focuses on the newest branch, located in Sydney, Australia, and it’s the first “written” by Patterson and Michael White, with previous books taking place in locales like Los Angeles, London, and Berlin. The focus of the PI firm is to work alongside local law enforcement in tackling difficult cases by using state-of-the-art technology, since money is no object to the privately-funded team. Private Down Under follows main character Craig Gisto, tapped by Private founder and CEO Jack Morgan to head up the Oz HQ, alongside fellow investigator Mary Clarke, forensics expert Darlene and investigator Johnny Ishmah. Chaos erupts at the celebratory welcome-to-Australia party, when a man stumbles into the room, half-dead. He’s been stabbed a dozen times, and after Gisto removes the hood from the man’s head, he discovers the man is missing his eyes. The subsequent murder investigation leads straight to the Triad Asian crime syndicate. Before that investigation gets rolling, Gisto and Private run smack into a second case, equally gruesome and demanding. A serial killer is targeting rich housewives from the same Sydney neighborhood, which happens to be close to the Deputy Police Commissioner’s house. The murders occur in ritualistic fashion, and all of the trademarks, such as photocopied currency accompanying the body, are bizarre and difficult to trace. During his investigation, Gisto also faces tension from Police Inspector Mark Talbot, the man who was previously engaged to Gisto’s deceased wife. Dealing with Talbot not only means facing the demons of his wife and son’s death in a car crash, but also putting to rest the venom of Talbot, who regularly antagonizes Gisto throughout the investigation. Not only is Talbot still sore about Gisto stealing his fiancée, but the mere presence of Private in Sydney is an insult to local police, or at least Talbot. As a result, he regularly impedes the Private investigations of both cases, until the tension finally reaches its climax. The novel takes all of the Patterson brand’s hallmarks and raises them to a new level. The chapters are sliver-thin, the action non-stop, the wisecracks dry, and the cases full of unexpected twists and turns. Sprinkle in gruesome violence, a casually sexist attitude toward women, and this book really covers all its bases. Yup, it’s like your classic detective drama with all the ingenuity or respect for its readers drained right out. Sure, most of the characters, including the villain, are essentially types with no depth. The plot charges forward like a high-model sports car, leaving the reader no time for discernment or second thoughts. When the book finishes, it’s instantly tossed aside, relegated to the donation pile for the local library used book sale, and it’s on to the next thriller. 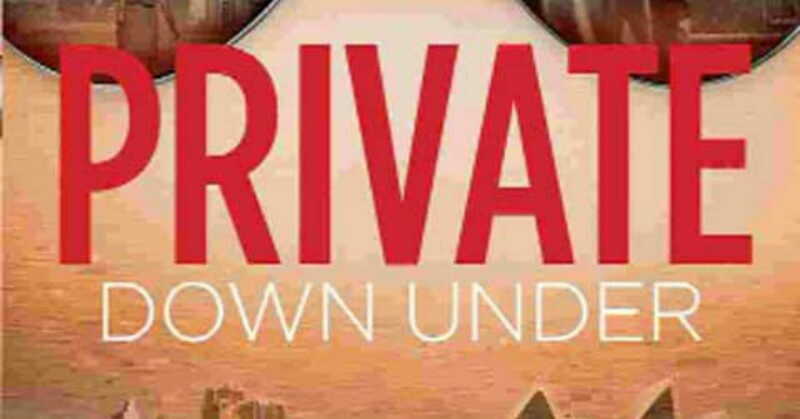 While nearly everything about Private Down Under is entirely predictable, that’s likely its appeal – readers know what they’re getting into when they turn the first page, and they get it. Nowhere has the concept of branding been more embraced and exploited than with Patterson, whose name now features the not-so-humble “The World’s #1 Bestselling Writer” tag above it on the book’s cover. And, as with other global brands, his books promise a completely uniform experience, able to be replicated each time a consumer digs in. Just like heat-lamped hamburgers, come to think of it.